ACRLog welcomes a guest post from Laura MacLeod Mulligan, M.L.S., Information Services Librarian, and Dr. Adam J. Kuban, Assistant Professor of Journalism, both at Ball State University. Academic buzzwords such as “interdisciplinary” and “collaboration” get paid ample lip service in university administration strategic plans and current scholarship, but practically speaking it can be difficult to begin or sustain such a partnership. With strong faculty support, public services librarians can become embedded in courses, revise assignments, review student output, and assess student learning—playing a more meaningful role in the physical and virtual classroom. We wish to reveal our methods of interdisciplinary collaboration—specifically what has given it longevity and made it successful. From evidence grounded in aggregate literature and personal anecdotes, we have developed a conceptual model for effective collaboration that could apply to any interdisciplinary partnership. Our own collaborative efforts began in January 2012 in order to revise the curriculum of an introductory journalism research course for undergraduates in the Department of Journalism at Ball State University. This ultimately led to the creation of an innovative, technology-based capstone exercise that exemplified the nexus of screencasts with library database instruction. We have also embarked on a research study that assesses the same students’ comprehension of information literacy concepts à la ACRL’s new Framework for Information Literacy. One of our current projects is a practical consideration of interdisciplinary collaboration (in particular between library professionals and faculty in the disciplines). Scholars who collaborate rarely read literature about collaboration before they begin endeavors. Even if you wanted to brush up on best practices for successful collaboration, you would have to wade through case studies and data surrounding discipline-specific scenarios. We began this project with a conceptual model based on personal anecdotes (i.e., a “model-first” approach) simply because it is natural to begin with “what has worked for us.” Please see our full paper from the 2014 Brick & Click conference for a full literature review where we discuss trends and themes in the literature and make recommendations for further reading. As we read others’ stories and studies and noticed patterns in what led to successful collaboration, we looked for areas of support as well as additional attributes that ought to exist as elaboration to the initial model presented. 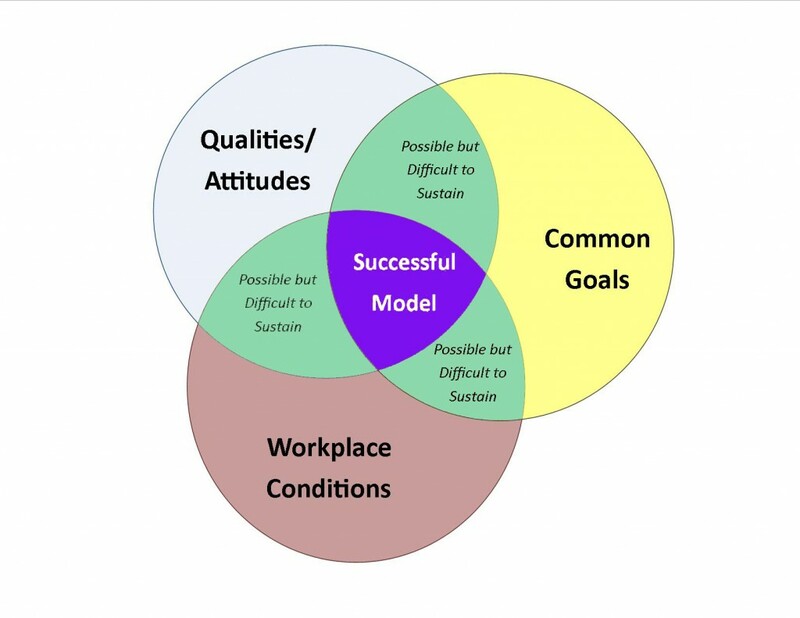 We identified and organized a non-discipline-specific conceptual model outlining the (1) workplace conditions; (2) qualities/attitudes; and (3) common goals that have enhanced our collaborative, interdisciplinary experience and could thus serve as a model for any faculty-librarian partnership. To help unpack the importance of these three facets, we sketched a visual depiction of it (see figure 1) and also shared personal anecdotes from our experiences (see table 1). Two of these elements can be controlled: (a) favorable attitudes and personality qualities toward interdisciplinary engagement and (b) common goals determined between the involved parties. The third element—(c) workplace conditions—is largely out of the collaborators’ control but still impacts the partnership. When all three facets come together, we believe successful collaboration can occur. In the event that one facet is absent or lacking, we believe that collaboration can still function but may be difficult to sustain. Essential to our collaboration has been regular communication. Keeping a standing meeting throughout the year has given us at least an hour per week to touch base, bounce ideas off one another, strategize, delegate, and debrief ongoing tasks. Booking a conference room in the university library gave us a neutral space in which to talk, think, and work without distraction. Having a coffee machine, audio/visual equipment (including a projection screen and speakers), and a large table made us feel comfortable and well equipped for any task—whether it be critiquing student screencasts, sketching out a four-foot-by-eight-foot poster, drafting correspondence to journal editors, or working side-by-side on separate computers. Arguably most important in this facet is apparent administrative support. We are fortunate to have current supervisors who embrace our collaborative endeavors, valuing it in subsequent reviews and evaluations. Without it, the interdisciplinary collaboration would likely end, as one or both would deem it too high-risk to continue. We have found that if there are common emotional qualities, a collaborative relationship can remain collegial and productive. In our experience, the following stood out as ideal qualities: a cooperative and compromising attitude; respect for and equitable treatment of individual collaborator roles; trust in one another’s competence; ability to be vulnerable, open, honest, and willing to learn; and an enthusiasm for the projects pursued. Collaboration among faculty and librarians sometimes results in the librarian acting in a supporting role to help execute the vision of a faculty member. In our collaboration, the roles are refreshingly equitable, leaving each person feeling like a co-leader. For example, Adam would not finalize student grades in his introductory research course without receiving feedback from Laura regarding their capstone projects (i.e., screencast database tutorials) in case there were incorrect aspects related to the library resources that she, as an information professional, could identify. This arrangement sustains the momentum and collegiality longer than a leader-follower partnership. While research styles and philosophies differ from discipline to discipline, we discovered that we share similar interests in information literacy, critical thinking skills, student engagement, and assessment driven by qualitative data. Projects stemming from these research interests have been undertaken more easily because of mutual pedagogical interests and shared research methods. We have been able to identify professional development activities that “count” for both of us, and we alternate the focus of activities to make for an even distribution. For example, after presenting at a journalism educators’ conference in summer 2012, we took a derivative of the material to a state library conference in fall 2012 to share our work with that audience. We’ve come to call this our “research pipeline,” and it keeps our activities equitable and interdisciplinary. What’s missing from the model? Once we had consulted the literature, one noteworthy qualifier emerged that deserves mention in an ongoing effort to conceive an evolving model that reflects effective interdisciplinary partnerships. This phenomenon could fit under the Workplace Conditions (resulting from administrative attitudes out of our control) or the Attitudes facet of the model (where it impedes expression of vulnerability in an attempt to solve problems and work together toward solutions). Postsecondary educators want students ready for an integrated marketplace. Programs of study require students to complete coursework outside of their chosen major(s). Experiential, immersive, and/or service learning are topics of discussion at conferences about college teaching. It seems that, as educators, we recognize the globalization of society and the overlapping nature of most occupations, and we want our students to have diverse, interdisciplinary experiences—thus it seems prudent to adopt a similar mindset for our own scholarly endeavors. We should set an example for our students, valuing efforts to “reach across the aisle” and emphasizing interdisciplinary opportunities. We believe our conceptual model could assist others as they begin to embark on interdisciplinary initiatives. In time, facets and qualifiers will evolve, transforming the notion of what equates to successful interdisciplinary collaboration. Pingback: My Interdisciplinary Connection Map | Help, I'm the Teacher! Previous Previous post: A World with No Meetings?! Next Next post: Let’s Assess!